These shiny 'S' Hooks are a welcome addition to the greenhouse and ideal to use with small fixing supports to hold hanging baskets. 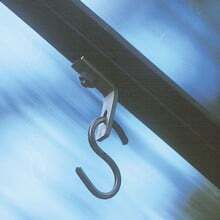 Supplied in packs of 5 each 'S' Hook measures 3.8cm (1.5") long x 2cm (0.8") wide. 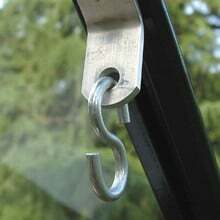 Perfect for my hanging basket with wire rings on the chains chains but unfortunately not big enough for plastic hooks on my other baskets. do what they are supposed to!